Outside Magazine, champion of living adventurously and actively, recently named the top 16 places to live in America. With the help of local Chef Ken Manring of White Tiger Gourmet, they were able to track down some true local gems in the #6 best place to live–Athens, Georgia. For the full list, visit Outside Magazine! At The National, we’re lucky to have a team of servers and cooks that aim to please…and even luckier to have excellent customers! As we usher in new hires, it’s probable that the first piece of advice shared is that here at The National, the answer is always yes. If you’ve sauntered through our bright blue doors more than a couple of times, it’s likely that we already knew you wanted gluten-free flatbread or a sparkling water with lime. But for the rest of you soon-to-be-regulars, it never hurts to ask for these things that will transform a regular meal into an exceptional one. We will always do our best to accomodate! This week, Bon Appetit Editor Rochelle Bilow gets down to the tricks of the trade. For those who have been afraid to ask, here are the ways to navigate your special requests at a restaurant such that you have a great time and the staff doesn’t hate you. When Nashville-based stylist and creative Ruthie Lindsey gets together with her girlfriends, you can expect the gathering to be outdoors (for sure) and the meal to be as beautiful as it tastes. Last month, our friend and former employee Emily Dorio brought our own Chef Peter Dale along for just such a gathering. Today, Emily is a talented photographer based in Nashville with an eye for food–both through her lens and with a fork. But she started out as a cook at The National when we opened in 2007. Together, Emily and Peter cooked and styled all the dishes enjoyed by the ladies that day. It was a blast, to say the least! Get the August edition of Better Homes and Gardens to check out the full spread and get inspired for your next Girls Night Outside! Get to know creatives Ruthie Lindsey, Emily Dorio, and Jessie Pickren through their stunning portfolios online. Who doesn’t love a day trip? Although many of us day trip to Atlanta, not from, we love Virgin Atlantic’s view of the Classic City from the other side. We’ve got it all, they say, from good listening, fantastic eating and drinking, and enough shopping and scenery to wander all day. Where would Chef Sarah Simmons of City Grit and new Birds & Bubbles eat if she could eat dinner anywhere tonight? She’d head back to her own college town, Athens, Ga., to dine at The National! After attending college with Chef Peter Dale, fellow Public Relations students at University of Georgia, plus years as cross-country peers in the culinary field, Sarah is happy to put her plate in Peter’s hands…as long as there is some sautéed okra on it. “Right now, I’ve been traveling on the weekends and cooking at college football games, and it’s making me really homesick for Athens, Georgia, which is where I went to college. So if I could go anywhere right now for dinner, it would be to The National in Athens. I would just let Peter Dale, who is the chef and owner, cook for me. I would eat anything he made. Read the full interview with Chef Sarah Simmons by Of a Kind here. On any given night we’d be thrilled to find ourselves at any of these places. From cocktails and snacks at Seabear Oyster Bar to a casual yet refined dinner at The National to a night cap at the Normal Bar, who wouldn’t! Chef Peter talks cheese with one of the South’s top cheese producers, Nature’s Harmony Farm. At The National we love using their cheese because not only is it local but it is also delicious and top of the line across the board. If you’ve ever wondered what makes a cheese soft and stinky versus elastic and sweet, it’s all in the wash! Read here for more details on difference in a washed rind and washed curds. One of our favorite Nature’s Harmony Farm cheeses right now is the new Cherokee Rose. Production of this cheese uses both the washed rind and washed curds techniques resulting in a “stinky” rind reminiscent of soft, washed rind cheeses but its taste overall is sweet. Try Cherokee Rose, and many more Nature’s Harmony cheeses throughout the year, right here on our cheese plate at The National! It’s critical to know where your food comes from and how it’s grown if you care about your health and the environment. When you tour the farm and dairy at Nature’s Harmony Farm it’s immediately clear that Tim and Liz “get it”. The land, their animals, the cheese and their customers are all treated with dignity and respect. It may sound trite, but you can definitely taste the difference. We often feature Nature’s Harmony Farm cheeses on our cheese plate accompanied simply with a baguette, apple and nuts. However, do yourself a favor and make a grilled cheese with Fortsonia! Now that it’s summer, put a slice of heirloom tomato in there too. You won’t regret it! We save the cheese rinds to make a cheese stock so we don’t let one bit of Nature’s Harmony Farm cheese go to waste! In the winter months, we use this stock to make a creamy cauliflower bisque, which is perfect on a cold day! At the moment we have ripe figs from just down the street. Things don’t get much better than Elberton Blue with fresh figs and maybe a drizzle of reduced fig syrup. It’s a perfect start or end to any meal, or at anytime of day…just because! In a town like Athens, music is king. It seems only reasonable that the musicians that inhabit this town would have the best insight into where to spends the lazy days of summer. In one of the best guides we’ve seen, The Noisey Blog by Vice asks members of Dream Boat, Pylon, and The Drive-By Truckers to share their favorite haunts around the Classic City. For the full guide, visit The Noisey Blog. We say, we want it all. And the counter culture of Athens often dictates the culture, a beautiful thing indeed. The flagship publication of Seaport Airlines highlights arts, entertainment and travel within the small airline’s ports of call. Flying out of Ben Epps Airport, Seaport Magazine highlights the multifaceted entertainment you can find in our Classic City. Hugh Acheson’s family of restaurants proudly represents the top of the food scene, between The National, Five & Ten and the newest addition Cinco y Diez. In the latest from The Culture Trip, the top 10 restaurants in Athens, Ga. are listed. Find the best in our gourmet food destination that has developed despite humble college town roots. Of The National, The Culture Trip writes.. Following the success of 5&10, Hugh Acheson opened his second restaurant, The National, together with talented chef Peter Dale. Sporting a more casual atmosphere than 5&10, The National puts top quality ingredients sourced from the best local producers at the service of a quirky menu inspired by Southern European and Mediterranean gastronomies. Here, guests have a chance to taste appetizing delicacies such as the Middle-Eastern hummus or stuffed dates, the Italian pizzette or the Spanish patatas bravas, before proceeding to the main course. Like the food, the drink selection is influenced by the Old Continent, with the wine card listing a rich selection of French, Italian, Spanish, Greek and German bottles. 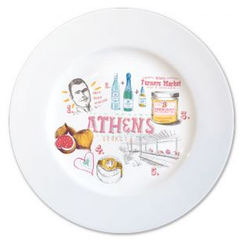 Conde Nast Traveler follows local artist Susan Hable Smith’s guide to Athens for a real taste of the town. Summertime visitors can take advantage of the slow season in a college town to really experience the quaint yet forward-thinking side of our Athens. Fortunately for locals and tourists alike, SEABEAR OYSTER BAR opens next week after much anticipation offering fresh oysters and vacation classics incorporating sustainable seafood. The first restaurant of its kind in Athens, SEABEAR is emblematic of the “eager young farmers and chefs” behind the town’s farm-to-table movement, says Hable Smith. Chef Peter Dale is working to resurrect the state’s once-thriving oyster tradition, and the menu includes such classics as beef carpaccio, oysters Rockefeller, and mussels steamed in pale ale. Located in The Bottleworks at 297 Prince Ave., Suite 10. The hundred miles of highway stretching between Macon and Athens are designated as Georgia’s Antebellum Trail. Along this road, travelers will encounter communities large and small that are rich with historical sites and good Southern food. Proud to mark the Northernmost end of the journey, the Classic City offers numerous historical homes, the State Botanical Garden, the Georgia Museum of Art, countless bars and a flourishing food scene we are honored to be a part of at The National….just to name a food good things. If you find your Memorial Day Weekend lacking, hop on the trail and finish your journey with us for dinner this Monday night! This weekend, let him tour you around our fair city with this guide brought to us by Design Sponge. Read his full story here. 7:45 am: Independent Bakery, for a quick morning coffee and a fresh baguette. 9:30 am: Waffle House for some mid-morning waffles and a small order of well-done hash browns, smothered. 10:25 am: A walk to The Arch – while walking downtown, to contemplate greatness – on the way to Wuxtry to grab some tunes and see a flyer for a show at the 40 Watt. 11:17 am: The REM Trestle for a break from the hustle and bustle. 2:30 pm: Two Story for a mid-day writing session with a good cappuccino. 7:00 pm: Dinner at my restaurant, The National. I will enjoy fabulous vittles with Mediterranean sensibilities created by my pal Peter Dale. 8:30 pm: Old Pal to sit at the bar and drink some bourbon. 10:00 pm: End up at 40 Watt to wrap up the day with a show. We’ll see you at 7 o’ clock! This month, Southern Living ponied up the best bars across the South to name the top 100. We couldn’t be more flattered to be among such a talented, creative group. And even more so to be included in the three bars from Athens, alongside our friends at Normal Bar and The World Famous. They recommended, and so do we, to sip on our Cold Weather Mojito, with Prichard’s Tennessee rum, Steen’s cane syrup, mint, and ginger beer. We couldn’t have said it better ourselves. Thanks Molly for taking a trip down food memory lane in Athens. Included in her list of good eats by and for the locals: The National and Five & Ten. Check out the full tour at Bourbon & Boots here! 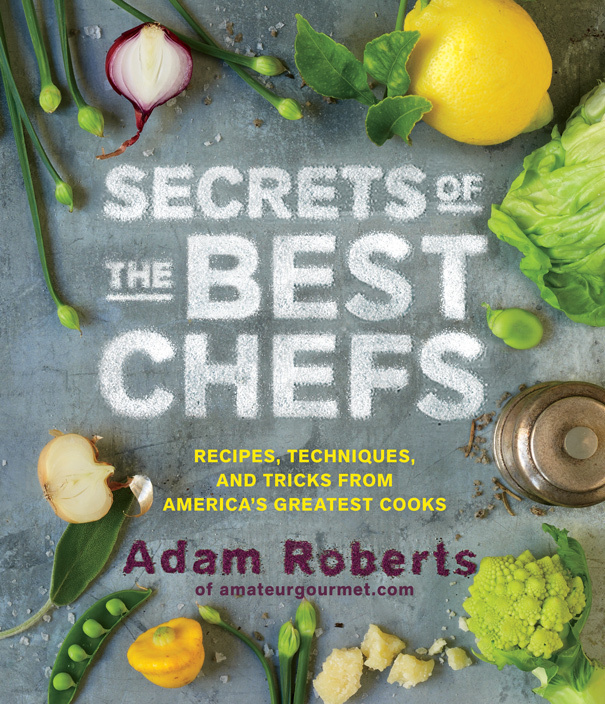 Just in time for the holidays, Adam Roberts (of amateurgourmet.com) brings us Secrets of the Best Chefs, straight from over 50 of America’s best kitchens. As some of the country’s most innovative chefs share the tricks of the trade, you’ll soon find yourself cooking at home with the finesse of a seasoned pro! Our own Chef Peter Dale ranks among the chefs in this great new cookbook, so if you’ve ever wanted a peak behind the scenes of The National, be sure to put Secrets of the Best Chefs on your wishlist. Mr. Roberts sums up Dale’s inspiration to perfection– “A very Southern touch in a very Spanish dish; that’s the way Dale likes to cook and the way his customers like to eat here in Athens”. Getting There: Air Canada operates four daily non-stop flights from Toronto to Atlanta. Athens is then a 90-minute drive away. Chef Peter Dale has joined Oceana, the largest advocacy group working solely to protect the world’s oceans, and more than 500 chefs, restaurant owners and culinary leaders in a letter calling on the United States government to require that “seafood is traceable in order to prevent seafood fraud and keep illegal fish out of the U.S. market.” The letter, led by sustainable chef Barton Seaver, has signatories from nearly all 50 states, including top chefs Mario Batali, Rick Bayless, Daniel Boulud, Thomas Keller, Jacques Pepin, Eric Ripert and Michael Symon, who are all ‘committed to serving seafood that protects our oceans, our wallets and our health. To read the letter, and for a complete list of its signers, please visit www.oceana.org/chefletter. For more information about Oceana’s campaign to stop seafood fraud, please visit www.oceana.org/fraud. This Athens, GA City Guide by Design Sponge comes from Alyssa DeHayes and Natasha Murphy, one a publicist for Athens-based Team Clermont and one a freelance web developer, both UGA grads who share a love of live music, great food, fancy cocktails and shopping. From eateries to flea markets, they share the best of this southern city. 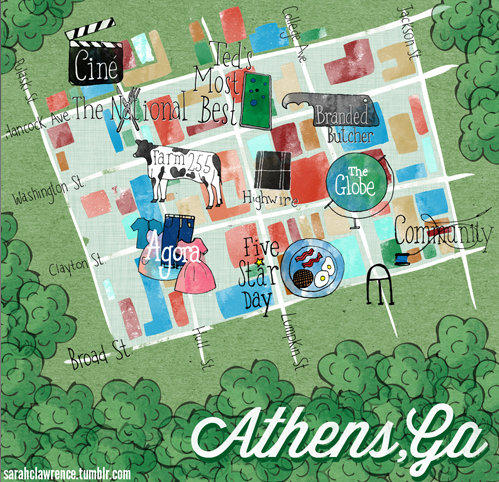 Thanks Design Sponge for a local look at our city of Athens! Plus, check out this Google Map with all of the below listings!